Oil and Gas is an industry that has gained notoriety as one of the most hazardous occupational sectors in the world. Characterised by the combination of powerful equipment, flammable chemicals, and high-pressure processes, the environment is such that even a small incident can have destructive, if not deadly, consequences. To account for such risk, the industry is governed by strict regulatory compliance, and it’s this proclivity to safety assurance and stringent operational activity that helps to alleviate many of the possible threats. However, it remains impossible to prevent crises from happening entirely, and, when disaster strikes, the fallout can have truly catastrophic consequences. For this reason, crisis management for Oil and Gas is of monumental importance. To shed some light on why, including poignant real-life examples, here, we offer a summary of some of the disasters that can occur throughout the sector. Due to the sheer flammability of materials, gases, and chemicals required to keep rigs operational, and the highly flammable substances being extracted, the risk of fires and explosions throughout any drilling facility is incredibly high. Once ablaze, platforms are often very challenging to extinguish until the fire has nothing left to consume, putting the lives of workers as well as surrounding habitats in imminent and continuous danger. Often, fires and explosions are seen as the second stage of a primary failure, such as a gas leak or mechanical malfunction, but they can occur almost spontaneously, such as in the case of the C.P. Baker Drilling Barge disaster in the Gulf of Mexico. Back in the early 60s, the drilling barge was engulfed with fire and explosion just minutes after the crew noticed a system blowout. The vessel sank upside-down in the water after around 30 minutes, and only 22 of the total 43 crew members on board survived the disaster, most of whom saved their lives by abandoning ship. As many rigs are situated in the middle of the ocean, they remain perpetually at risk of a collision from sea-faring vehicles. While the impact of a small fishing boat would have little to no effect on the structural integrity of a rig, platforms are regularly visited by large oil tankers used to transport the vast quantities of crude oil or natural gas back to land, and these ships present a far more significant threat. It takes only a momentary lapse in concentration, a technological malfunction, or poor weather conditions to cause a severe collision, such as in the case of the Mumbai High North disaster in the Indian Ocean. On July 27th, 2005, strong swells pushed a multipurpose support vessel towards the Mumbai High North platform. The collision hit the rear of the vessel rupturing one or more of the platform’s gas export risers. The resultant gas leakage ignited, setting the platform on fire, and the resulting oil spill caused significant environmental damage. Due to the uncontrollable and often intense conditions that rigs are exposed to on a constant basis, the weather remains one of the most influential risks impacting platform safety. Changes in wind speed, temperature, or ocean current can impact a rig’s integrity and, by extension, the safety of all its crew. If all three factors combine in one event, then the results can be deadly. This was the case with the Ocean Ranger oil rig disaster, situated off the coast of Canada in the North Atlantic Sea. In 1982, the rig capsized due to a powerful storm which produced 190km/h winds and up to 65ft (20m) high waves. Crew workers abandoned the rig and moved into the lifeboat stations, but only one lifeboat could be launched successfully. This accident remains one of the deadliest offshore oil rig accidents in history, with all 84 crew members on board losing their lives. A highly flammable and often toxic substance, gas itself is another major threat to the well-being of platforms. 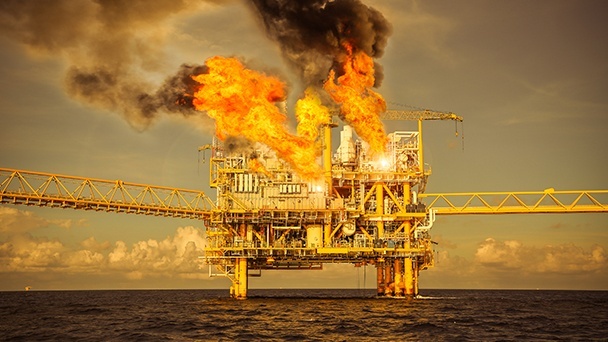 Not only can gas leaks lead to huge explosions that threaten the health of the platform, but petroleum gases and vapours consist of harmful toxins like benzene, butane, and methane, which can incapacitate the crew, impeding them from carrying out their duties safely. The deadliest offshore oil rig accident in history, Piper Alpha, occurred due to gas leakage and claimed the lives of 167 people in 1988. Communication errors between crews led to the activation of a pump that wasn’t fit for purpose. This resulted in leakage of gas condensate, causing gas ignition and serial explosions on the platform. Only 61 of the 226 workers survived the disaster, and it took close to three weeks to control the fire. Mechanical failure, in this sense, refers to any form of machinery malfunction that occurs while the machine is operating within its design constraints. Modern-day platforms are heavily reliant on machine-powered systems, and even the smallest mechanical error, such as a broken crank or a faulty valve, can have cataclysmic consequences. The Deepwater Horizon calamity, one of the most infamous disasters of the 21st century, was caused by a mechanical failure in one of the blowout preventers. This fault led to an uncontrollable blowout, causing an explosion that claimed the lives of 11 crew and ignited a fire so massive it could be viewed from over 40 miles away. The fire was inextinguishable, and after two days the rig sank, leaving gallons and gallons of oil gushing into the seabed – one of the largest oil spills of all time. The risks associated with the Oil and Gas industry are significant and broad, and the fallout can be monumental and, in many instances, lethal. Despite the sector having some of the most stringent health and ‭safety policies, the threat of disaster cannot be extinguished entirely and to mitigate the fallout, emergency planning is essential. Contingency planning is about assessing enterprise risk and putting processes in place to deal with a potential emergency. It aims to ensure that everyone who has a role in handling a crisis knows their responsibilities, tasks, and the authority they operate under. A crisis management plan won't prevent disaster, but it will help to control the fallout after one occurs. To learn more about the value of contingency planning, specifically how to approach the creation of one in terms of structure and content, download our free ebook.